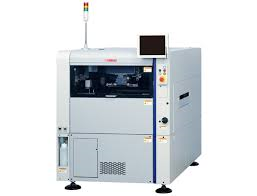 【YAMAHA】YCP10 | Products （Solder Paste Printer ）| MASS CO., LTD.
Printing quality similar to flag ship models, compatible with large circuit boards and a wide variety of stencil frames. Built-in features from high-end machine models deliver high print accuracy and quality! Multiple functions and extreme versatility all wrapped into 1 compact unit! Support for Yamaha SMT production line network, delivers highly efficient production.